15 Union Square West built in 1870 was the headquarters for Tiffany & company flagship store. The original 1870 cast-iron framework is undergoing a modern makeover in a cubistic glass tower. The building is being converted to luxury condos. The current design of the building incorporates 36 residences, which includes the construction of an additional six floors atop the original structure. The 12 story building maintains its original cast iron facade behind a wall of dark glass with a mix of irregular glass cubes above. The condominium offers valet parking through a nearby garage. Building amenities include: A 50-foot 2-lane pool, a gym and a Pilates studio. Residents will be able to control blinds, lighting and temperature from a single keypad. Each of the apartments on the top six floors will have outdoor space. May of the apartments feature woodburing fireplacs and views over looking union square park. All residences feature 5" wide Maple floors throughout and top of the line appliances: Viking, Sub-Zero and Miele, including a laundry room with a Miele washer/dryer and Crestron Home Technology System. Current available units for sale range from a 1872 square foot 2 bedroom 2.5 bath home asking $4,680,000 to a 2806 square foot 3 bedroom 3.5 bath home for $8,946,000. 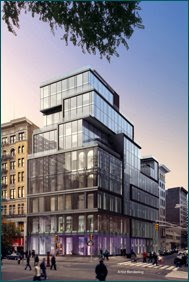 Click here to receive available listings at 15 Union Square West or anyother new development/conversion in Manhattan.